The Senate President, Dr Bukola Saraki, and Speaker of the House of Representatives, Mr Yakubu Dogara, have visited President Muhammadu Buhari in London. 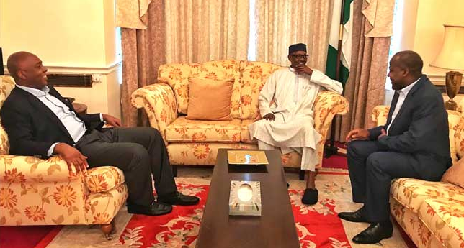 President Buhari received the Senate President and the Speaker at the Abuja House yesterday, The Presidency confirmed the visit in a tweet with the above photo. Their mission for the visit was however not disclosed.